My primary election opponent is engaging in the kind of disgraceful campaigning usually reserved for out-of-state candidates. Most recently, this “campaign of deception” focused on my participation in the Farmland Preservation Program. For those unfamiliar with the program, it purchases the development rights of eligible farms, placing a permanent easement on the properties that forever limit their use to farming and open space. The 20-year-old initiative has permanently preserved more than 120,000 acres of agricultural land on 850 Delaware family farms. Two farms in which I have an interest were included in Round 18 of the program in 2013. The first one is a 94-acre farm located near Abbott’s Mill that is jointly owned by myself and two sisters. The other is a 91-acre property, situated just north of Georgetown, which I own with my wife. This last farm, in continuous agricultural production under my family’s ownership for more than 100 years, is designated as a Century Farm. While funding for the Farmland Preservation Program passes through the General Assembly, the legislature has no role in deciding which farms are selected for participation. 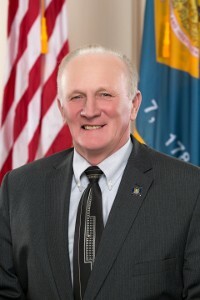 Those decisions are made by the Delaware Agricultural Lands Preservation Foundation – 13 trustees, mainly appointed by the governor, representing the farm community and several state agencies. The owners of farms that have been entered into agricultural preservation districts are eligible to compete to have their land’s permanent development rights purchased. The value of those rights is appraised by the state. This information is shared with property owners who must then compete against each other by offering the rights for sale at steeply discounted rates. The properties selected by the Foundation are chosen entirely on the size of these discounts. Before my family submitted our applications, we looked at the discounts offered by landowners chosen in the previous three rounds. This information is available to the public and is posted on the Department of Agriculture’s website. The average collective discount in Rounds 15, 16 and 17 was 65.7 percent. Using these indicators as a guide, we offered a discount of 64 percent. As a result, our properties were among the 43 farms (4,460 total acres) selected in Round 18. The discount we offered exceeded the average of 61 percent for the round. To summarize, the General Assembly has no role in picking which farms are selected for permanent preservation. Selections are approved by an independent board through a competitive process that favors those property owners who are willing to sell their permanent development rights for the lowest value. My family’s two farms were selected three years ago because we aggressively discounted the properties’ development rights. For our family, the decision was an easy one. We are all getting older and those properties have been in our family for a long time, in one case for more than four generations. Both are reasonably attractive for development. We wanted to ensure that whoever next owns these farms will plant crops and not houses. We were more than willing to sell our development rights for just 36 cents on the dollar to make that happen. My participation in the Farmland Preservation Program in 2013 has been transparent and well-documented. Details are posted online, as they are for the hundreds of other Delaware farm families that have taken part. I find the tactics of my opponent, Bob Mitchell, to be shameful. In making his unsupported allegations that I unfairly benefited from the Agricultural Lands Preservation Program, he also carelessly impugns the honesty of 13 Foundation Trustees charged with impartially approving successful applicants. In the circles I travel, you do not call someone’s integrity into question without having indisputable evidence to support your charges. Our citizens deserve better public discourse than Mr. Mitchell’s malicious remarks and unfounded innuendo. 15 Comments on "Dave Wilson Responds"
While funding for the Farmland Preservation Program passes through the General Assembly, the legislature has no role in deciding which farms are selected for participation. Since you are paid by funds made available through legislation, and since you are a member of the General Assembly, couldn’t that be construed as a “personal or private interest” pursuant to Article 2 Section 20? Did you vote on the appropriation bill? Now, I am not attempting to question your integrity. As you stated, farms are chosen based on the discount offered to the state. I get it. “Member,” “private interest,” “bill.” There is no mention of how the appropriated funds are dispersed. Sure, my point is technical, but so is the law, although it’s application may not be. In any case, Mitchell’s point is not entirely without technical merit. It is not a question of “integrity,” but rather, a strict interpretation of the law. Of course, in a state where the courts ruled that “conservator of the peace” means “process server,” the actual words of our constitution have no real meaning whatsoever. Should a meme of the legislature vote on the appropriations bill if they have a child in public school? It is safe to say that on something as broad as the appropriations bill, then unless the members of the legislature do not live in the State of Delaware, then there is some impact on each of them. The point is about using their position for personal benefit. The legislature did not confer s personal benefit on Mr. Wilson in that bill. Or did you entirely miss the point about how the funds are actually appropriated by the commission? Voting to fund a public school isn’t a “personal or private interest,” since the schools are public. His children are members of the public. I think that the Delaware Constitution infers a pecuniary interest. This would be the logical intent of the legislature when they wrote the pertinent section, A2 S20. …did you entirely miss the point about how the funds are actually appropriated by the commission? No, I didn’t. But where in A2 S20 does it mention how the “personal or private interest” monies are distributed? It doesn’t. It plainly says that legislators must recuse themselves from voting on bills that, if passed, would provide a personal or private interest– in this case, money- to any individual legislator. I do not for one minute believe that Wilson is corrupt or is guilty of using his office for personal gain. Neither do I live in Wilson’s district. I am merely pointing-out that his response to Mitchell’s accusation rings a bit hollow if one takes the time to read Article 2 Section 20 of the Delaware Constitution. At a very minimum, there is at least enough of a foundation in Mitchell’s claim to foster a debate. But Rick, voting for the bond bill, which is an omnibus package make the two exactly the same. Just because the funding is within the bond bill is no guarantee Wilson would be chosen in the process. Anymore than voting to fund the Department of Education guarantees his children would receive benefits. Since he did not cast a vote that sent money directly to him , it does not meet the requirements of Article II sec 20. To buy into Chicken Bob’s premise, one would have to believe that Dave Wilson needed the money so badly, he took advantage of the program and his position. But considering the program selects the lower bids, it baffles the mind to wonder why one would not sell land on the market, where instead of $400,000, he could have made millions. One wonders how it is possible that anyone in the General Assembly votes to authorize their own pay as members of the General Assembly. I would think, being a business man, that someone who sells something for 36 per cent of tis current value, is not financially benefiting to the best of his ability in pursuing the arrangement. Put aside all the other evidence. For if the vote came out differently, or his farm had been removed from the bill, he could sell for 100% of his value… Which means for this alleged charge to hold any water, he would have to vote no on the bond bill. If you wonder about it, look it up. The provision for so doing is likely in the constitution. The “case” will be “dismissed”- or not- in the primary. You will never get it. It’s a bond bill that funds a foundation. The foundation is the reciever, not any individual. Thats why you can vote for the bond bill and at the same time send your kid to U of D, have relatives recieve Seed Scholarships, etc. The bond bill is huge and benefits all. Held to your simplistic litmus test, most would probably have to abstain. Find something real to perpetually comment about. A small testimonial here. A couple of years ago I was speaking at some length with an official from the State Parks at one of their public hearings. I was aware that someone had been waiting patiently behind me to speak to him as well. When I finished, I turned and saw that the person was Dave Wilson. Small acts such as this can provide insights into character. Find something real to perpetually comment about. I didn’t start the thread. Since I don’t live in Wilson’s district, I don’t care what happens. However, as I stated earlier, I certainly don’t think Wilson is corrupt. With 13 trustees to determine the beneficiaries of the allocated funds, I look at this to be more of a technical, rather then collusionary, conflict. Dave being the only appraiser to have his business cards displayed in the Register of Wills office while he was Register of Wills, a practice continued under Gregg Fuller, I find a much more concerning, as it shows a willingness to use an official position to further his business. The part that most puzzles me most is that Dave is an keen business man, I have and will continue to utilize his business services, but I’m not sure I can continue to support his candidacy as I have in the past. Any photos to back up your claims? Nope. Not one single incumbent should be re-elected, R or D. They all need to go.